In this Photoshop Effects tutorial, we're going to learn how to turn a photo into a collage of squares. It's a fun effect, and it's really easy to do, especially since most of the work is simple repetition, as we shall see. As I said, most of the work is just repetition, so once you get "into the groove" with what you're doing, you won't even need to think about it. You can just have fun creating the effect. Hold down "Ctrl" (Win) / "Command" (Mac) and click the "New Layer" icon to add a new layer between the two existing layers in the Layers palette. 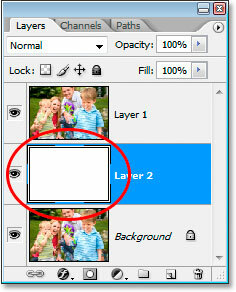 The new blank layer is now between the Background layer and "Layer 1". Just a quick note before we continue.... We're going to end up with lots of layers by the time this effect is finished, and normally that would mean we'd definitely want to make sure we're naming our layers as we go. In this case though, you'd probably drive yourself mad trying to come up with descriptive names for each layer, so unless that sort of thing appeals to you, I wouldn't worry about naming your layers when creating this effect. Generally speaking though, naming layers is a habit you should get into. Having said that, let's continue. We need to fill this new layer with white, since we're going to use white as our background color for the effect, so press the letter D on your keyboard to reset your Foreground and Background colors, which makes white your Background color, and then with the new blank layer selected in the Layers palette, use the keyboard shortcut Ctrl+Backspace (Win) / Command+Delete (Mac) to fill the layer with white. The thumbnail preview for "Layer 2" is now filled with white in the Layers palette, even though "Layer 1" is currently blocking it from view in the Document Window. 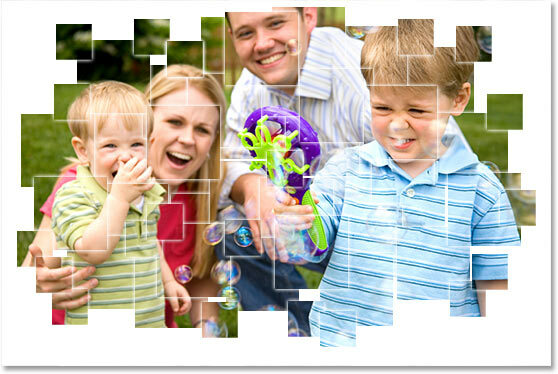 Use the Rectangular Marquee tool to draw out a square selection inside the image. In order to constrain the selection to a perfect square, hold down Shift as you drag. 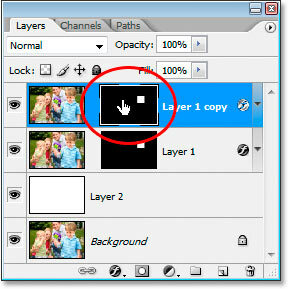 Click the "Add A Layer Mask" icon at the bottom of the Layers palette. 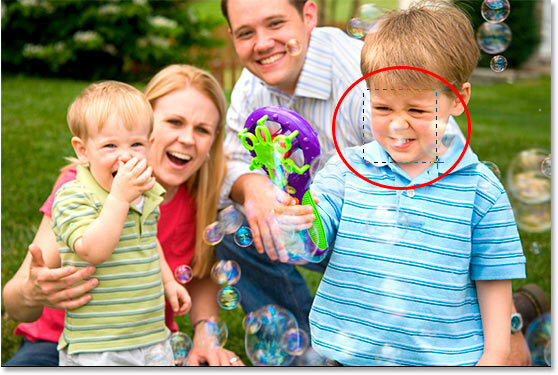 The square area around the boy's face is now all that's visible of the image. The white background is now visible behind it. 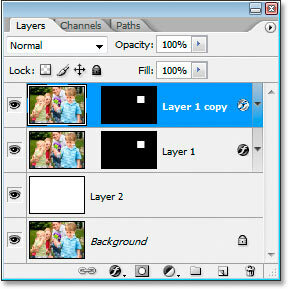 The "layer link" icon between the layer thumbnail and the layer mask thumbnail for "Layer 1". The link icon between the layer thumbnail and the layer mask is now gone. We can now move the mask without moving the image. With the layer mask selected, click on the "New Adjustment Layer" icon. Select the "Outer Glow" layer style. Click the color swatch in the Outer Glow options to change the glow's color. 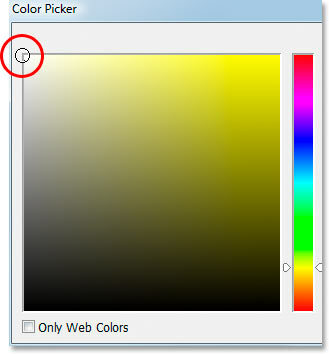 Click in the top left corner of the Color Picker to select white as the Outer Glow color. Then I'll click OK to exit out of the Color Picker. My Outer Glow color is now white. I'm going to leave all the other options for the Outer Glow alone and just click OK at this point to exit out of the Layer Style dialog box. The white Outer Glow will be added to the layer mask. We won't be able to see it in the image just yet because it's a white glow against a white background, but we'll see it once we start adding more square sections to the image, as we're about to do. 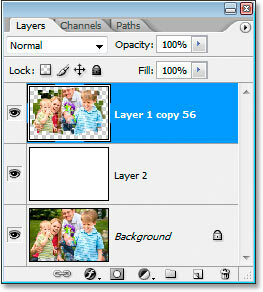 The Layers palette now showing the duplicate of "Layer 1" at the top. When I say "exact copy", I mean exact copy. Not only does the copy contain the image, it also contains a copy of the mask and the Outer Glow layer style, so we don't have to add another mask or another Outer Glow ourselves. Everything's already there for us. Also, because the layer contents and the layer mask on "Layer 1" were not linked, they're not linked on the copy, either, which is exactly what we want. Select the Move tool from the Tools palette. 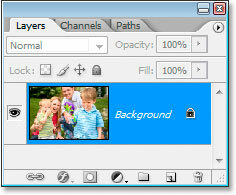 Click on the layer mask's thumbnail in the Layers palette to select it. It will have a highlight box around it to indicate that it's selected. 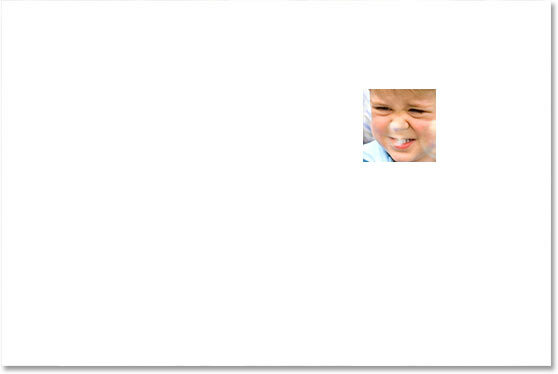 Drag the mask to a new spot in the image to create the second square. I now have two squares, and if you look in the top right corner of the one I just created, you can see the white Outer Glow defining the edges of the square. At this point, it's simply a matter of repeating the last two steps until the main areas of the image are visible inside the squares. So first you press Ctrl+J (Win) / Command+J (Mac) to duplicate the layer. Then, and this part's very important, click on the layer mask thumbnail of the newly created layer to make sure you have the mask selected, not the layer contents. If you try to drag the mask to create a new square and instead you see the image inside the square moving, you have the layer itself selected by mistake. In that case, press Ctrl+Z (Win) / Command+Z (Mac) to undo, then click on the layer mask thumbnail and try again. Continue this process of duplicating the layer, selecting the mask, and dragging the mask to a new spot in the image until all the important areas of the image are showing. It's okay to overlap the squares, and don't be afraid to leave an occasional empty space between them either. It just adds to the effect. 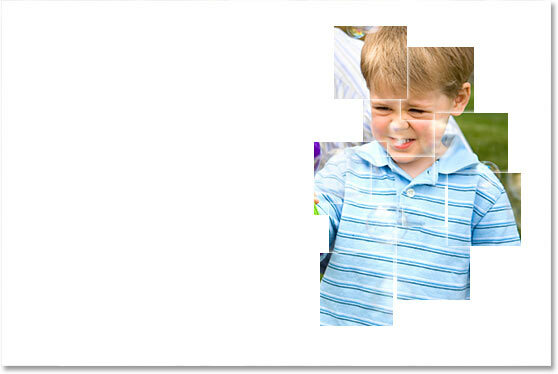 The image after adding enough squares to bring the boy on the left into view. 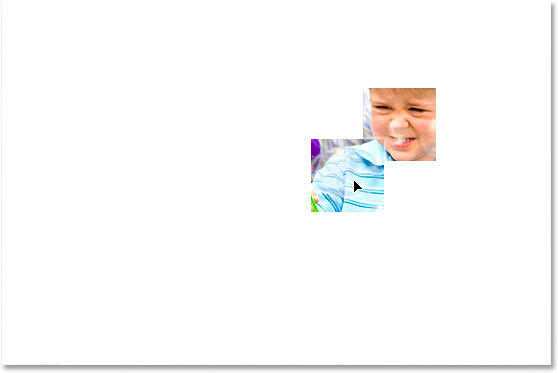 After adding more squares, the boy's mom and younger brother are now visible. Enough squares have now been added to bring the main areas of the photo into view. The main part of the effect is now complete, and for the record, I now have a total of 36 squares in the image. You may have more, you may have less. It really depends on the image you're using and how many squares you think it takes before the effect looks "right". I'm going to finish off the effect by adding some smaller squares in the corners and around the outside edges. Use "Free Transform" to reduce the size of the square mask by about 50%. 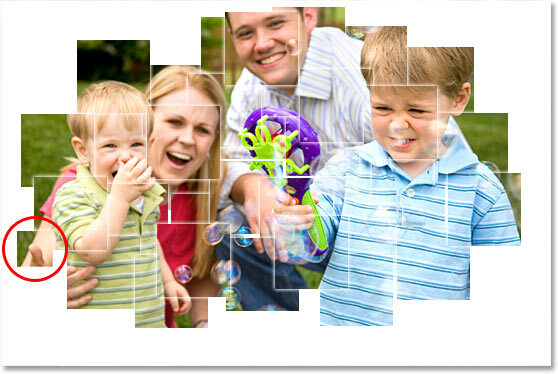 Use the Move tool to drag the smaller square to somewhere along the outer edge of the collage. After adding all of my smaller squares to the image, I now have a grand total of 56 squares, which means I have 56 layers that contain a square-shaped mask. I want to complete the effect by adding a drop shadow to the collage, but I can't do that very easily when the collage is made up of 56 separate layers. I need to merge them all onto one layer. To do that, in my Layers palette, I'm going to click on the top most layer to select it. Then I'm going to scroll all the way down and Shift-click on "Layer 1", which is the layer that started the whole collage. 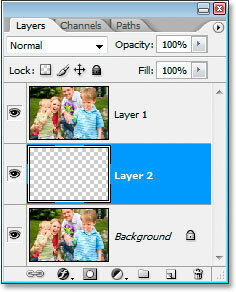 This will select all of the square mask layers at once (you'll see them all selected in the Layers palette). 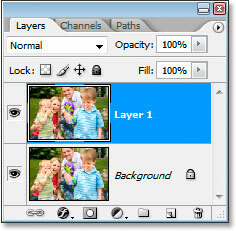 The Layers palette now showing only three layers, including the newly merged layer at the top. 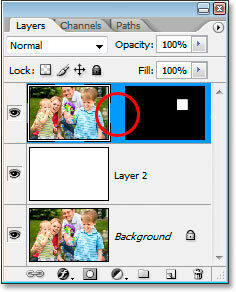 With the merged layer selected, click on the "New Adjustment Layer" icon and choose "Drop Shadow". Lower the opacity value of the drop shadow so it's more subtle. And there we have it! 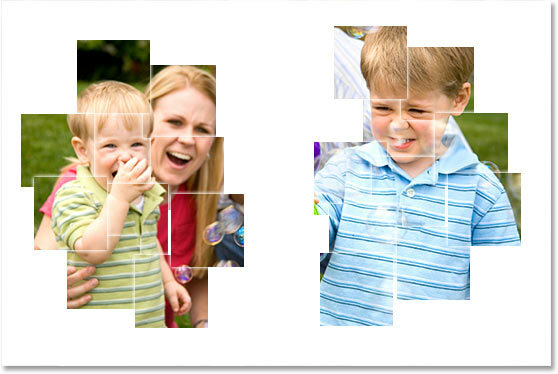 That's how to turn a photo into a collage of squares with Photoshop! Visit our Photo Effects section for more Photoshop effects tutorials!